Collection of wine accessories is one of the favorite hobbies for most of the true wine lovers or wine connoisseurs. Moreover, if these accessories are exclusive pieces, then the entire environment of the bar counter becomes elegant and luxurious. 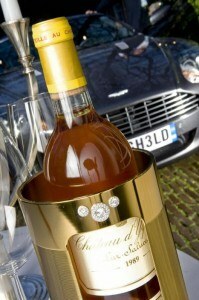 Amsterdam based La-Fraicheur launched one of the most luxurious and expensive wine coolers for the elite of society. This wine cooler is embellished with crystals and brilliantly cut sparkling diamonds. This exclusive wine accessory is made of aluminum and is divided into four main sections: a sleek tube, base, inner ring and a grid. This cooler is an asset for wine connoisseurs. Its compact design and elegance with unique functional features give a different look to one’s bar counter. Its elegance and beauty adds a royal and romantic ambience to the bar. This unique wine cooler is available all across the globe at an exclusive price tag of $145,000.